Beau Barnett's blog | Random musings from a smart-aleck Jesus-loving sports obsessed wannabe writer. If you’ve ever read anything on this blog, you know that I fancy myself a writer. Whether I am any good or not is a matter of debate (I have had people call the same short story both “stupid” and “brilliant” with the the “stupid” comment coming from one of my closest friends), but through it I have become friends with some amazing people, who have more talent than I will ever have. One of these people is a sweet Kentucky redhead, Megan Whitmer. She’s definitely one of those people that are far more talented than I am. Her book, Between, which will absolutely be on my shelf on release date, will absolutely BLOW YOUR MIND. I literally shed tears in public when she announced her book deal. Anyway, this is how she changed my life. She is at least partly responsible for my new found belief in my writing. This is because she is the brain child of a weekly Twitter event known as #writeclub. Megan does a marvelous job of explaining things in a post on her blog here., but basically it is a group of writing sprints that last 30 minutes at a time with 15 minute breaks in between. She tweets the start and stop times from the @FriNiteWrites account on twitter, using the #writeclub hashtag. At the end of 30 minutes, several people will tweet the number of words they managed in the sprint, which because I’m a numbers dork, I track. It is so amazing to see so many people from around the world loving and encouraging each other. It has grown seemingly exponentially, with now at least 6 different people helping to run sprints when real life gets in the way. Its even branched out internationally, with it going on in the UK literally right now as i write this. I’m honored to be a small part of it. A couple of ways. I don’t feel like such an awkwardly antisocial nerd when I choose to stay home and write on a Friday night instead of going out. There’s an average of 50 or so people doing the exact same thing I’m doing. When I’m having a bad day, there is always SOMEONE having similar writing struggles where we can encourage each other. See, these sprints aren’t competitive in nature. They’re meant to encourage and build each other up, and inspire us to do more. That’s why I love write club. It’s why I don’t even WANT to go out on Fridays anymore. Literally, right now I’m counting down the minutes until we start it up tonight. Join us, why don’t ya? We start at 8et and will likely go to around 2am. We’d all love to have you. So, the lovely and talented Darci Cole is having a contest on her blog in honor of getting 100 followers. Basically, she posted this photo and challenged her readers to write a 300-500 word piece of flash fiction inspired by it. The word/number 100 must appear in the piece. There were prizes, that included critiques of your manuscript. I don’t have anything that is REMOTELY critique ready so I chose not to enter the contest, but, really that photo is amazing and this story came to my head immediately. Pretty rarely for me, I actually think this story is pretty good. Here we go. Seriously, give me a comment or two and let me know what you think, k? I looked over at my wife in the passenger seat, and smiled. She smiled back, a quick, upward twitch of her lips, reaching over and clasping my hand. She mouthed the words, “I love you.” It was a foggy, misty evening. 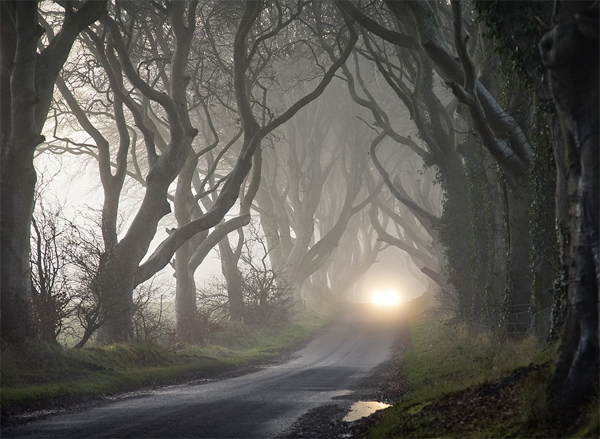 We were traveling through a heavily wooded area, the scraggly trees forming a canopy over the road, blocking the moon. We were on the way back home from a trip to her parents. “I love you, too, Jules.” So much. She let go of my hand and ran her hand up the inside of my thigh, leaving it there. “Please, baby. Go faster. I need to be in your arms,” she breathed. I could feel her words against my ear more than I could actually hear them. I stomped on the accelerator, watching the speedometer climb past 70…80…90…100 miles per hour. At 120, she purred, excitedly. At 140, she raised her eyes skyward and laughed, the wind taking the sound and magnifying it somehow. I drove as fast as I dared, tires squealing around the corners, threatening to lose grip at any moment. The faster I drove, the more she loved it, beaming all the more whenever the car downshifted and the engine roared. The way her long, curly, dark hair was blowing in the wind, I swear, she looked like an angel. “Oh, baby,” she said, breathing heavily, almost panting, “I’m going to rock your world when we get home.” I drove even faster, my face a stoic look of absolute concentration on the road ahead. A cough from the backseat brought me back to the present. I looked in the rearview mirror, seeing two brown eyes staring back at me. I smiled. “You ok, Lydia?” I asked. “I miss her too, Pumpkin.” I looked over at the empty passenger seat, a single tear rolling down my cheek. Hard to believe it had been 5 years tonight. She was so much like Jules. “Of course,” I replied, and hit the gas. Is there anything scarier in the world than letting someone in to your soul? Especially if it is someone you admire and who’s opinion you value? What if that person takes a peek into your soul and doesn’t like what he or she sees? Anything more soul-crushing than that? The tortured life of a writer….